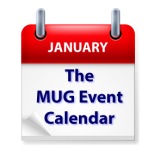 The highlight of this week’s MUG Event Calendar is Apple’s appearance at a California creative pro group this week to show off the new features of Final Cut 10.4.4 Other meeting topics include Photos at a New York group, and Apple Watch at a Florida group. Naples MacFriends – Everyone Wants An Apple Watch. Why? Los Angeles Creative Pro Users Group – Apple returns to lacpug for a rare appearance and will show off some of the new features in Final Cut Pro 10.4.4. Also Emery Wells, CEO of Frame.io will present their workflow extension, the first collaborative video review toolset that can be accessed right in FCPX. Also YouTube superstar Jonathan Morrison. who has over 2.6 million subscribers to his channel, will be on the agenda. Also a Show and Tell from writer/director Celine Eva Gimpirea Also, Stump the Gurus and World Famous Raffle.